Good Afternoon Happy Stampers!! Cynthia here and I'm back for another day of awesome projects. 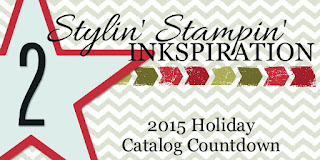 Today is the fourth day of our 2015 Holiday Catalog Countdown with the designers at Stylin' Stampin' INKspiration! Good Afternoon Happy Stampers!! Cynthia here and do I have a fun and exciting announcement for you. 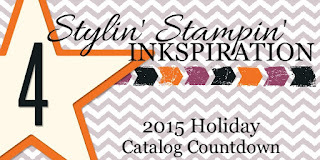 Today is the first day of our 2015 Holiday Catalog Countdown with the designers at Stylin' Stampin' INKspiration! Good morning my stampin' peeps! Its Friday, Friday, Friday! 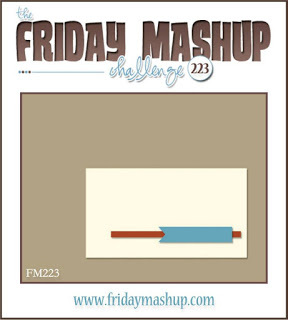 Today I am, of course, over and playing with my fellow designers at The Friday Mashup! Just about all of us now have sent our kids back to school, WHOOP WHOOP, and are getting back into our normal routines! This weeks challenge is a fun sketch from Bree with a theme of "back to school". When it comes to school and teachers, you can never have to many "thank you" cards laying around. Teachers are such an important part of our kids lives. They look after and teach our kids while we can't be with them. I love sending a thank you card with a simply pack of gum, mints, candy bar, small bag of candy, or cookie, pack of pencils or pens, sticky note pads, etc... just to show I appreciate what they do for my kids!! Good morning peeps! 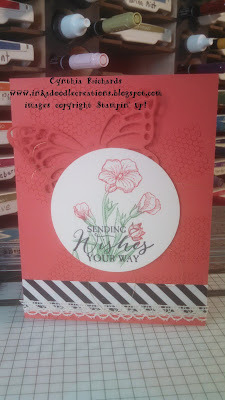 Today I am over at Stylin' Stampin' INKspiration and I am sharing one of my favorite design team challenges yet. So all the designers who wanted to play, switched up names and mailed our person #3 items of our choosing. These items could of been a stamped image, a piece of ribbon, a button, etc.....once we received or mystery items, we had to take a picture of our items and then get to work creating putting together a project using them. Let me just say, I had so much fun! So Jennifer had my name and the above items is what she mailed me. Do you think these items would be tricky? The only trick I had was trying to find a way to use all three of the blossoms. I just love the color she chose for me to work with. Mini Macaron is one of my favorite new In Colors. Here is what I came up with....isn't it just lovely. I started with a card base of whisper white and cut a layer of white and embossed it with the large polka dotted folder. I used her piece of DSP and cut off 1" to use to opposite side for a banner layer down the middle. (One can't choose just one side, you need to enjoy both!) I cut out a circle layer using my framelit set and attached the butterfly with some dementionals, after adding some silver twine in behind. I decided to place my #3 blossoms in the center of the butterfly. I am happy with how it turned out in the end. 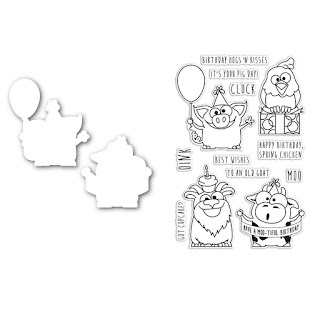 Create a Birthday Themed project. Create a project using any kind of Technique you'd like. or Mash it Up! 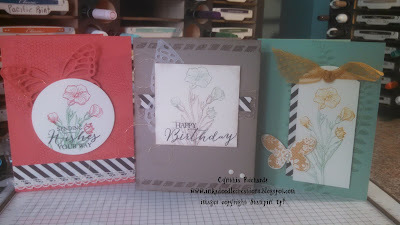 and created a Birthday themed project and any Technique. After I saw this cute stamp set I knew it had to be mine. My sister loves pigs so this card is getting mailed to her next week for her birthday! Find out more details about this cute bundle by clicking the image above. It will take you straight to Simon Says for item details. How can one resist the coloring of these cute little farm critters. They want to help you celebrate your birthday in good old farm like style! 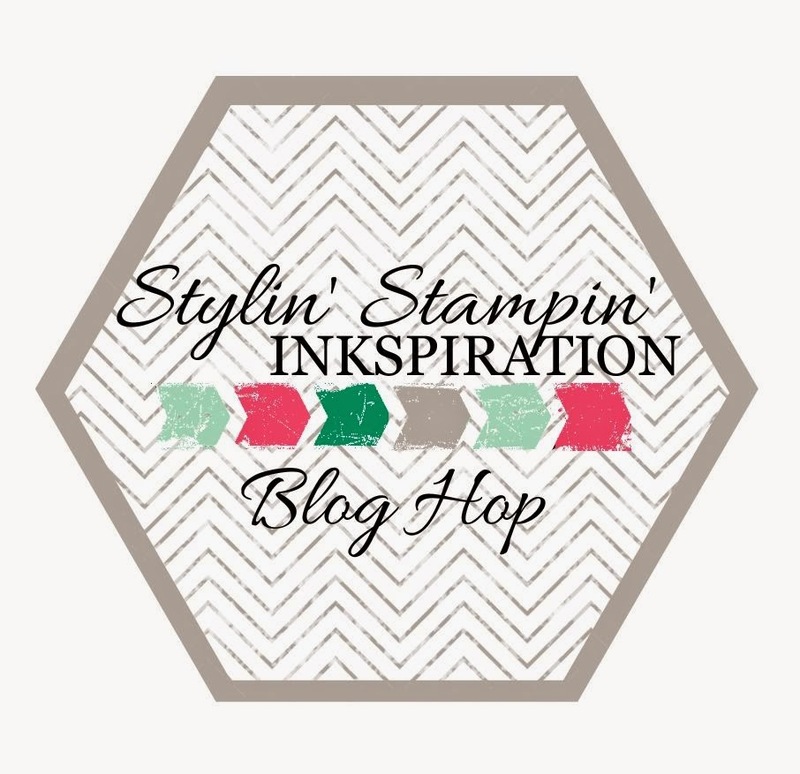 Welcome back for another fun and exciting BLOG HOP with the designers at Stylin' Stampin' INKspiration. 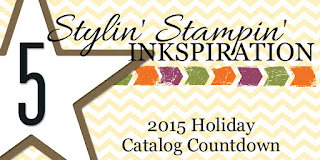 This month our blog hop is focusing on everyones favorite bundles from the Stampin' Up! catalog. Which one do you think I chose?!? As you hop along, please be sure to comment and show some love on every blog! We are always excited to hear from our followers! You should have just left stop number #2 on the Stylin' Stampin' INKspiration Blog Hop - Jennifer with Happy 2 Scrap 4 Life. If so, you are in the right spot. If a link doesn't work or you get off track, you will find the full blog hop lineup below. I have several bundles that I enjoy, but the butterfly basics is truly one of my favorites. 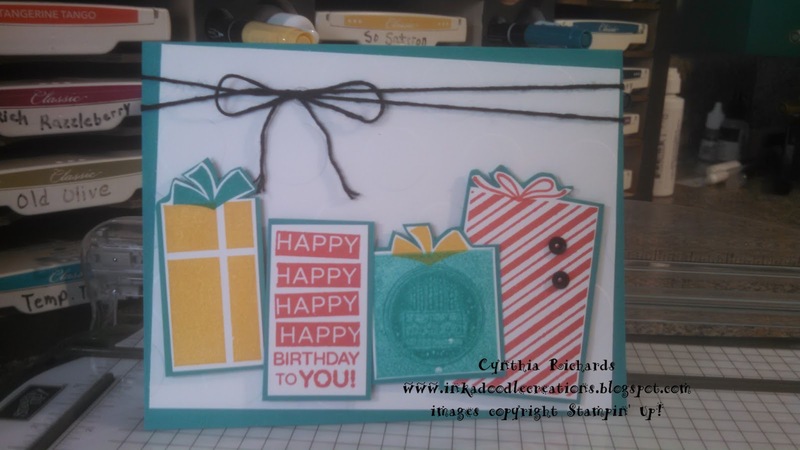 Its very easy to use and versatile in creating any style of card. I couldn't just stop at one, I have to create and share three different versions using all new in colors for my bases and ink choices. I stayed consistent with the use of the stripes from the typeset DSP pack. 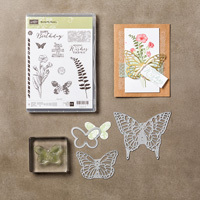 The base and butterfly is using Watermelon Wonder color. Second card, is using mint macaron and delightful Dijon ink for the flowers, butterfly and lace ribbon. 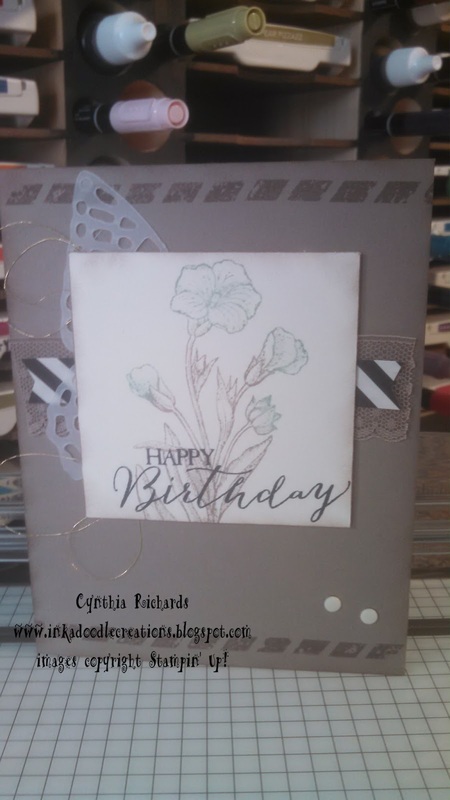 The third card has a base of tip top taupe and the flower is colored and stamped with tip top taupe and mint macaron. 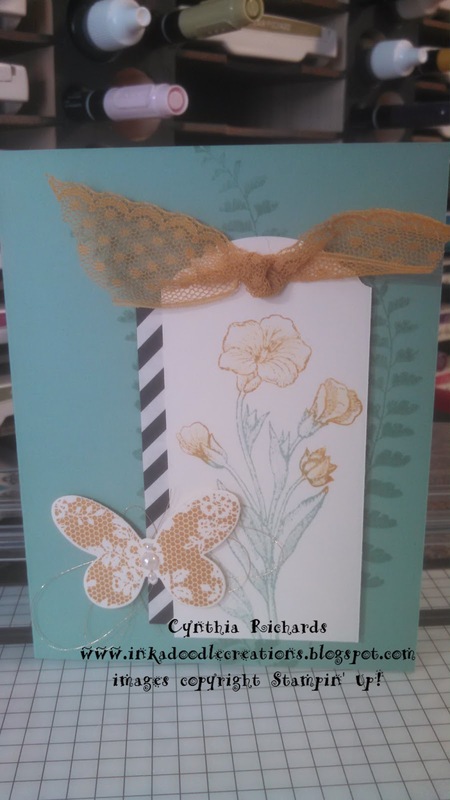 I used vellum to cut out half of the large butterfly from the die set. 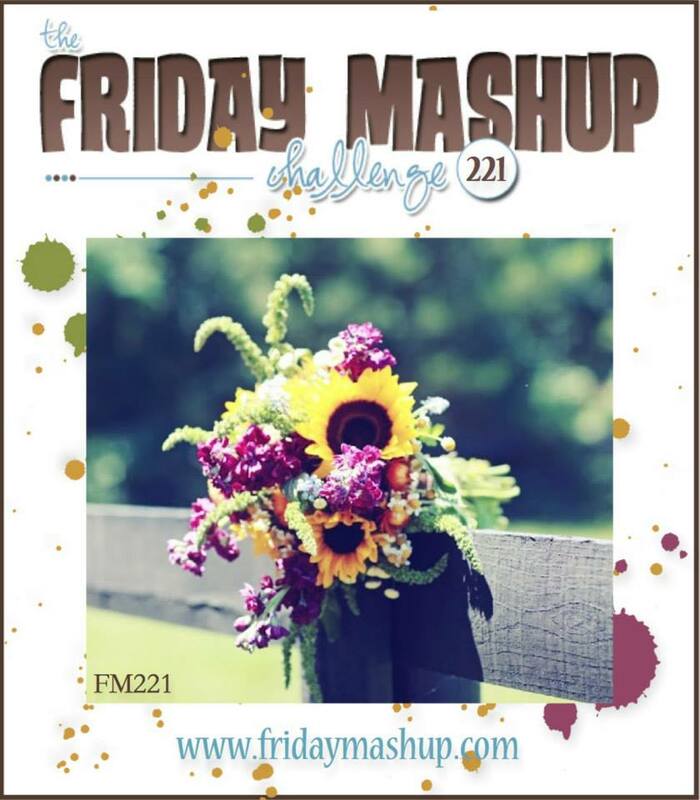 Now head on over to stop #4 and see what fun bundle Leanne chose to play around with! Leave me some "love", I always enjoy reading your comments! Good Friday morning. 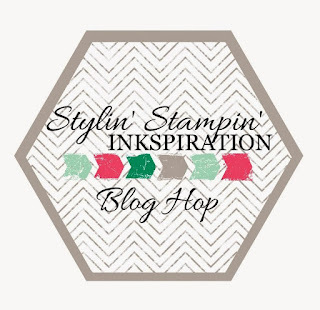 Today I am creating over at Stylin' Stampin' INKspiration. Today its all about being feminine. So let me begin by saying this card was created in error. I created it for what I thought was this months card sketch, but well....I was a month late. SURPRISE...it was last months sketch, but oh well...its never to late to share something creative and beautiful! I skipped out on getting the July Paper Pumpkin kit (what in the world, I know, why did I do that?!) Well thanks to my BFFF, Breelin, she knew I wanted it and surprised me with the kit at convention. For some reason I just love this super cute flower stamp set that it came with. So much that I used it on this card. It goes well with the pretty petals DSP stack. Good Friday morning, thanks for stopping by. 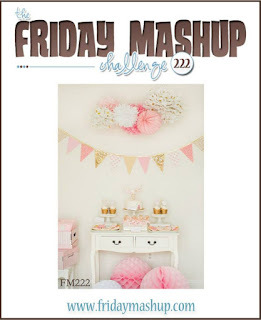 Today I am over at The Friday Mashup and am playing around with Lisa's new challenge for us this week. Its all about "The Fair". Who doesn't remember going to the Fair when you were a kid. Well maybe you still do love going! I haven't been to one in several years, but besides the fun rides, visiting with friends and the cotton candy, one of the things I remember was getting a candy apple. Think of what your memories are of the fair, grab those supplies and come play along. We can't wait to see what you create as always! 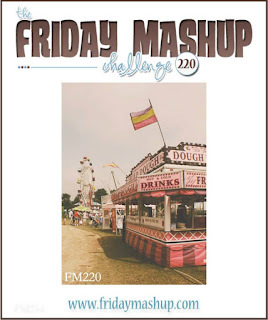 Create a project "inspired by the State Fair". 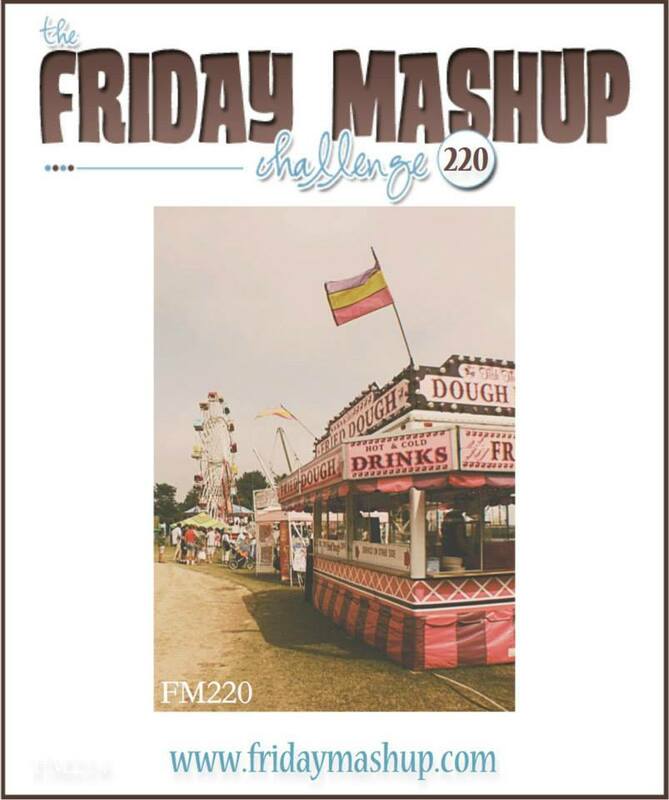 or Mash it Up and create a project "inspired by the Fair using your punches". My background is created with a piece of white paper embossed in the woodgrain folder and sponged with baked brown sugar ink. I cut it into two pieces and added a layer of plaid gingham garden DSP and burlap behind it. My candy apple is created with one 1-3/8" circle and I cut just a small portion off the botton. I also cut one more in baked brown sugar and used my snips to cut some swirls like caramel coming off the top. The stick for the apple is actually a pop cycle stick. I always make sure I have some laying around! 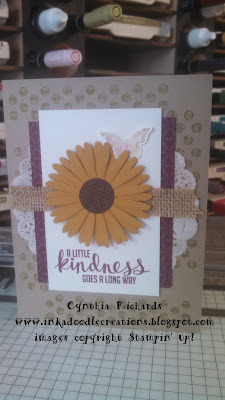 Now that you've seen my "fair" project, leave some "love" and head on over to see what the other designers have created! Good Monday morning! I hope you all had a wonderful weekend. I ran my first ever "muddler 5K". It was awesome and I had so much fun! 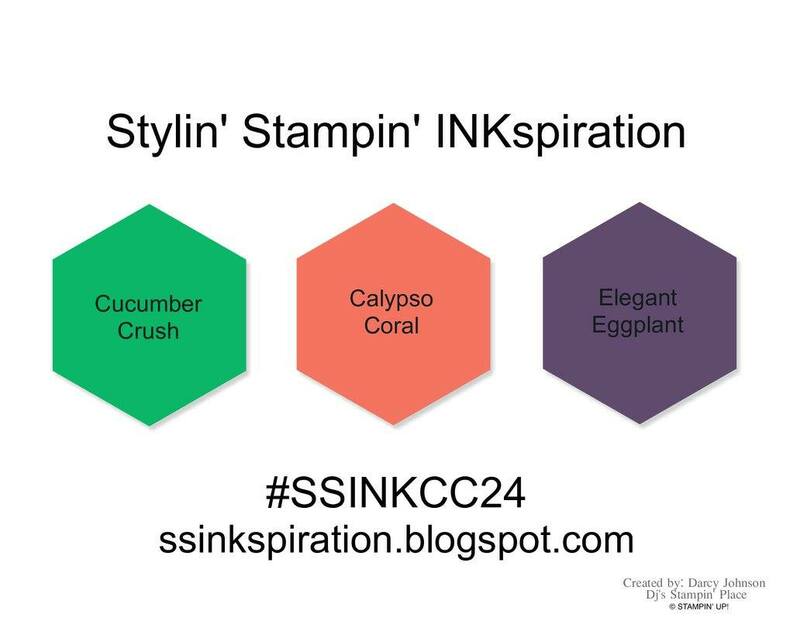 Today I am over at Stylin' Stampin' INKspiration and its time for an all new color challenge! We hope you will decide to play along with our challenge. and this is what I created with it! I used the background stamp from the You've Got This stamp set and stamped and gold embossed some of the small cluster flowers from the Birthday Blossoms stamp set for the background. I also stamped two of the large flowers and leaf clusters in gold embossed too and watercolored them in calypso coral and cucumber crush. I finished it off with some gold ribbon quirls, pearls, gold sequins and I cut out the word "thanks" and embossed it in gold too! 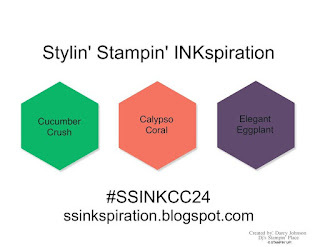 I hope you have been inkspired by my color challenge card. Leave some "love" and go check out what the other designers have created. 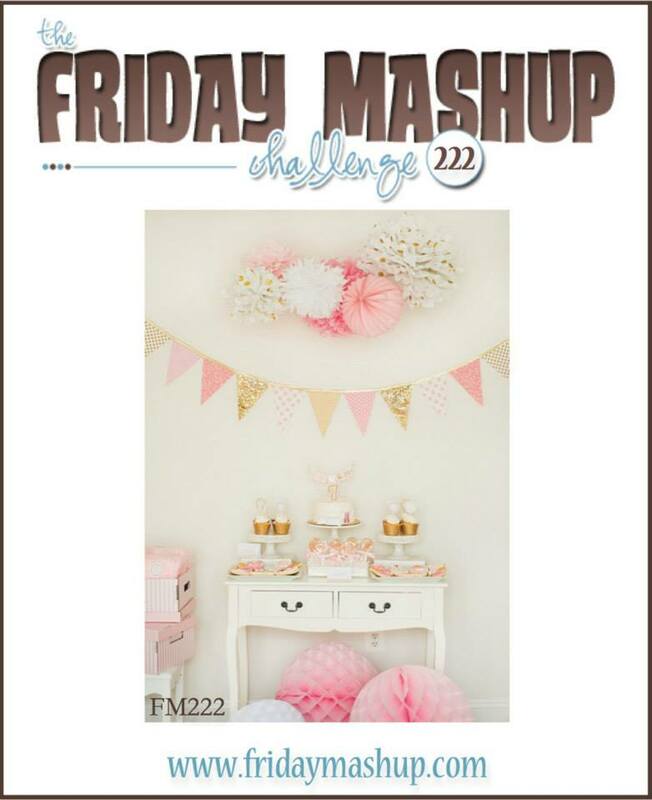 Don't forget to grab your own supplies and enter our fun challenge with us! We can't wait to see what you create!